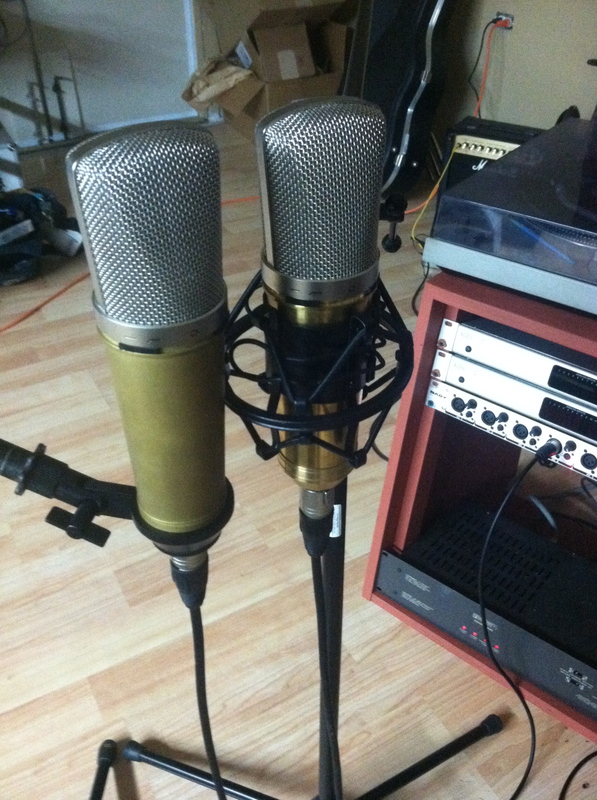 Back in my studio days, we had a pair of AKG 451s, and we thought we were hot stuff. 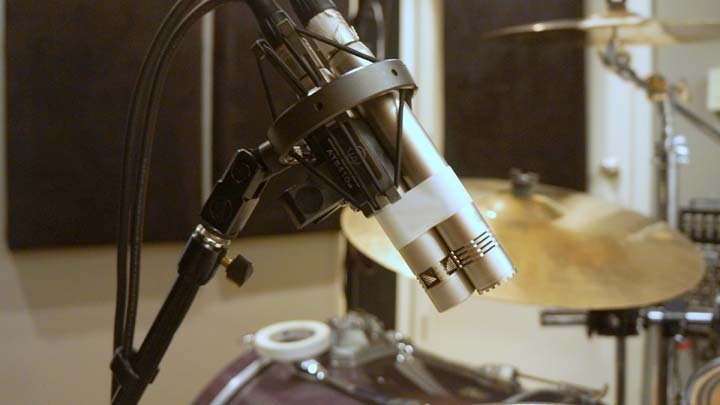 The 451 is a beautiful microphone, and we’d been using them for several years with great results… my favorite job for these was stereo drum overheads. 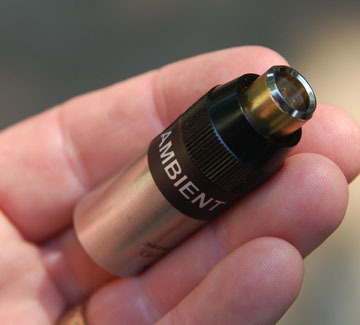 Then one day Robert brought in a pair of these tiny little microphones… Neumann KM84s. 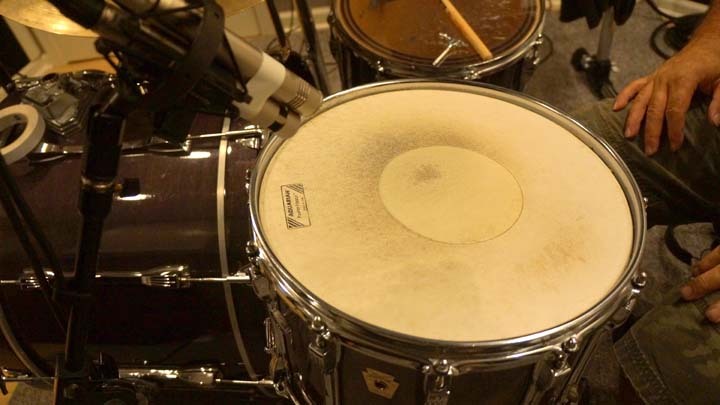 We set them up right next to the 451s as a pair of drum overhead mics, and switched back and forth to compare them and… wow… the difference was amazing. The KM84s sounded every bit as bright as the 451s, but smoother, as if they had more “air.” They quickly became my favorite mic. Sadly, they went away when the studio closed. One got stolen… their tiny size makes them easy to pocket. And they were pricey even 25 years ago. But I’ve wanted my own KM84 ever since, even though I don’t really “need” one. And the price has gone up since then… Neumann no longer makes them, their current model is the transformerless KM184. 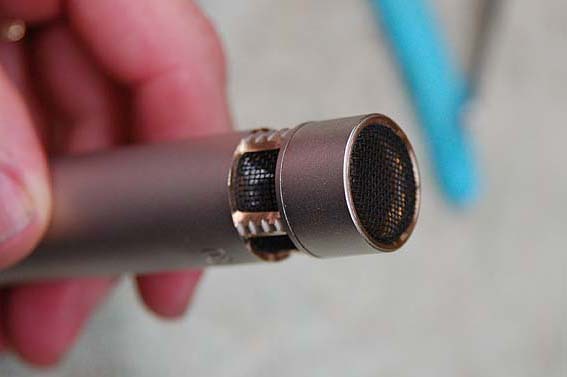 Some have said that the older KM84 is the preferred mic, as these are said to be “warmer” and “smoother” in their sonic character. The Nady CM90 disassembled. I understand these are pretty much identical to a number of inexpensive small-diaphragm condenser mics available, like the MXL603. I can, however, afford a Nady CM90. This mic is one of the thousands of Chinese clones that have flooded the market. It uses a capsule that is supposedly a copy of the Neumann KK84 design. The circuitry is derived from a Schoeps CMC6 transformerless amplifier. Nearly identical to the Nady CM90 is the MXL603, Apex 180, CAD GXL 1200, Cascade M39, and others. Some folks have reported that there is a difference in the diaphragm thickness… the Nadys have diaphragms that are 3-microns thick, and MXL603s have 6 micron diaphragms. Personally, I can’t tell. I bought the Nadys because they were only $35 each from B&H Photo, and if I totally ruined them, it would be less painful. Arrows show the new capacitors. 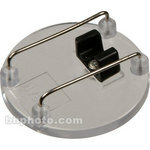 Typical circuit improvements are the replacement of some capacitors, changing ceramic types with polyester film types. 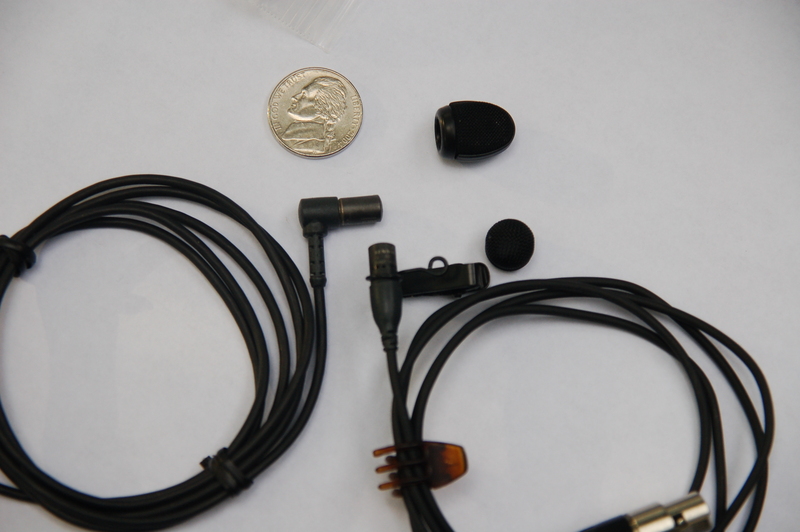 Face it, at $35 you can expect to see the cheapest components that’ll work in mics like these. I switched out three, using some parts I had on hand. The values are the same, it’s just the cap types that are different. A side note: I didn’t come up with the actual number-crunching engineering to figure out the electronics. 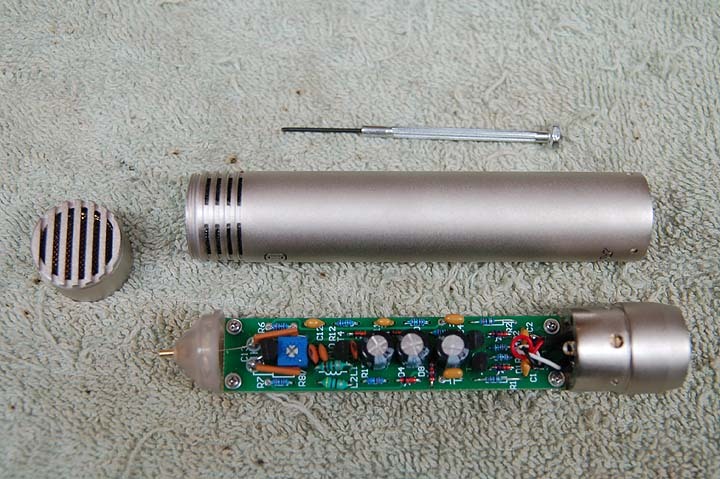 There is a small community of microphone builders on the internet (examples HERE and HERE) who, thankfully, are willing to share their experience and knowedge. A few of these folks actually did design work in the factories… it’s a real treat for sound geeks like myself to have access to these people. Without their help, I’d surely have a pile of dead mics as a result of my experiments, so I have to express my gratitude to these folks. The next modification was to the back vent area. As I understand it, (from Michael Joly of OktavaMod) decreasing the back vents increases the high frequency (HF) response of the mic, and these are known to exhibit a typical HF “peakiness.” Even though the Nady probably didn’t need it, (there are more back vent slots on the Nady than on the MXL 603) I fired up my trusty Taig milling machine and cut away the ridges in the back vents. I cleaned up razor edges with a small file and replaced the screen. 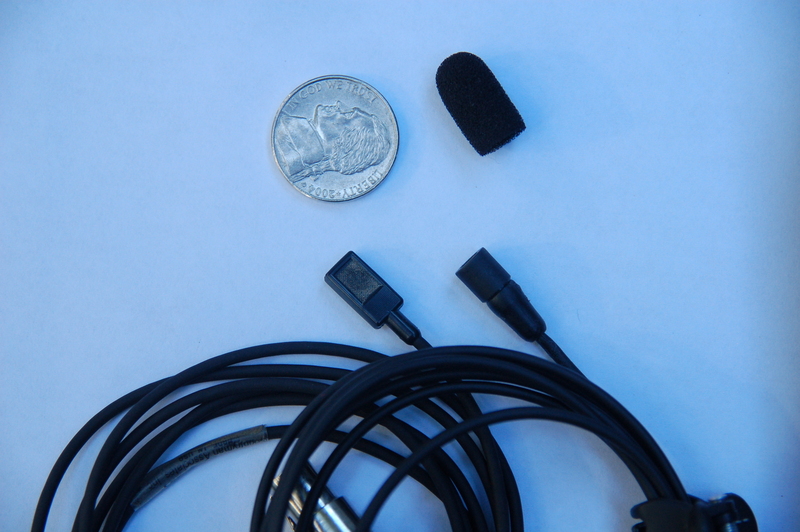 The other reported problem with these mics is the capsule mount. 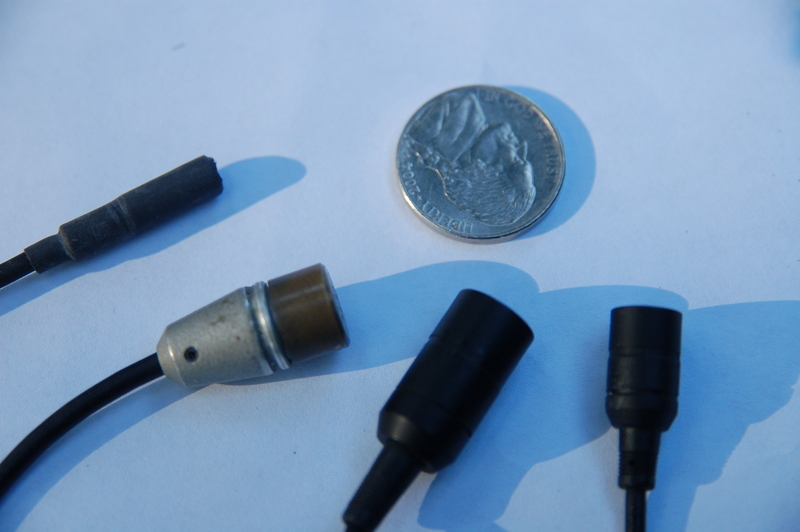 Again according to Michael Joly, the diaphragms on the chinese clones are set back into the body of the mics about 5mm, where the KM84s diaphram is positioned much closer to the top of the mic. That 5mm ridge around the diaphragm is enough to cause all sorts of HF problems. 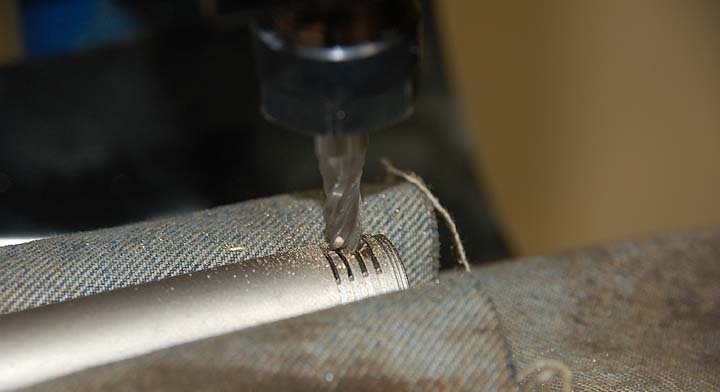 So I very carefully disassembled the capsule, chucked the shell up in my lathe, and shaved down the pocket. 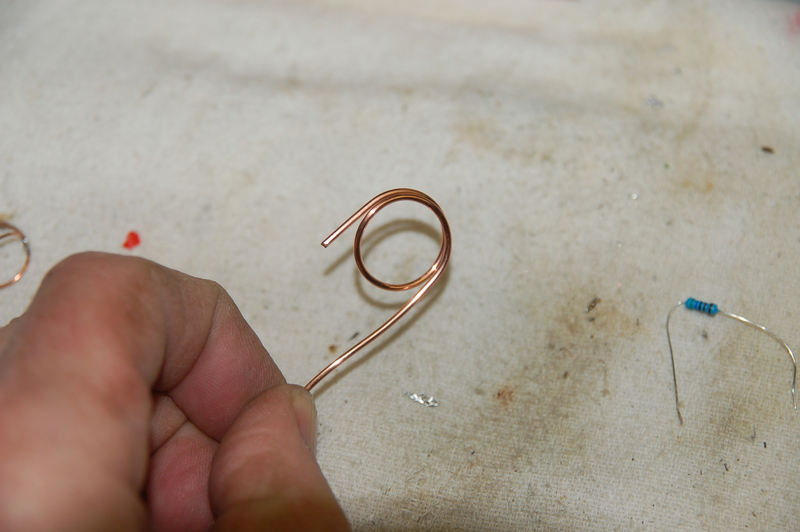 I also took the extra step of beveling the sharp edges, making it look similar in shape to the KM84. 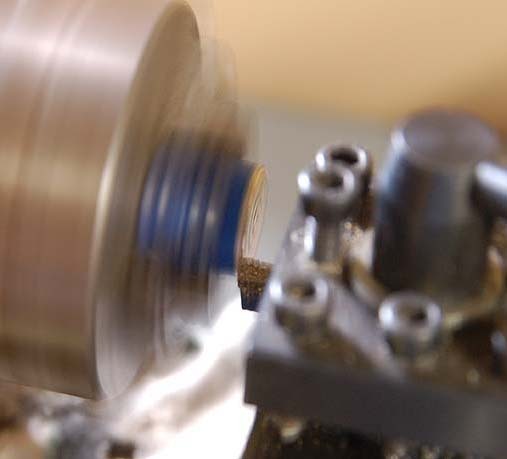 Parting off the face of the capsule shell in the lathe. 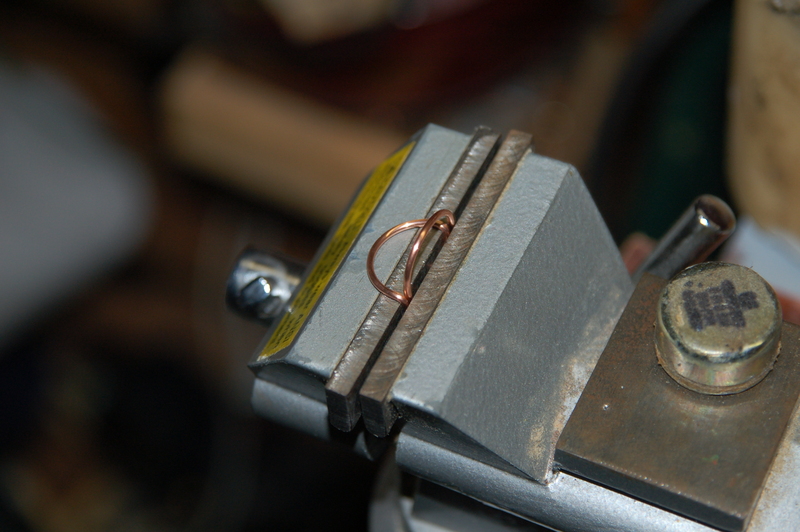 The brass is a little bit thin and easy to scratch, so I wrapped the shell with masking tape. It machines beautifully, though. 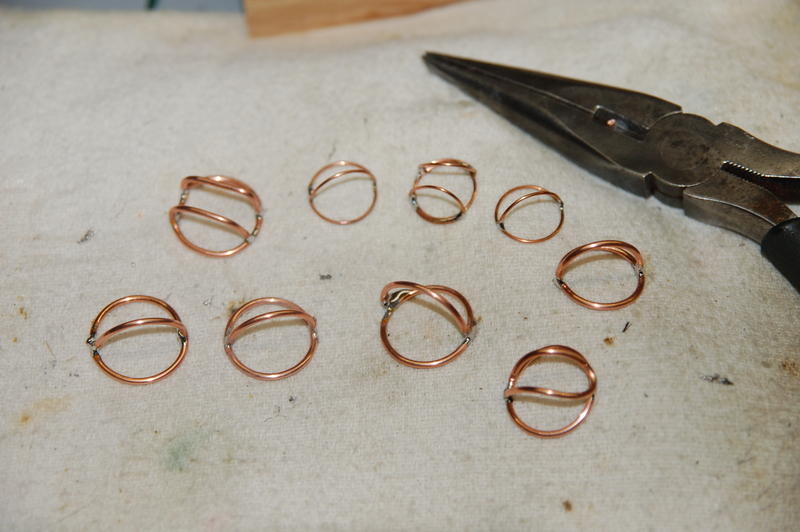 This operation could be done with a file in a pinch, but using a lathe gives better-looking results. I screwed everything back together and powered up the mic. The modified mic is clearly better than stock… the high frequencies do seem more extended and better defined. The stock CM90 exhibits a very slight kind of “splatter,” if you will. Make no mistake, my mic does NOT sound as good as a KM84. I didn’t expect it to. But it is interesting, and a little bit fun as well. I think I’ll send these up to another engineer in Nashville to see what he thinks. The next step in my upgrade path will have to wait a little while. 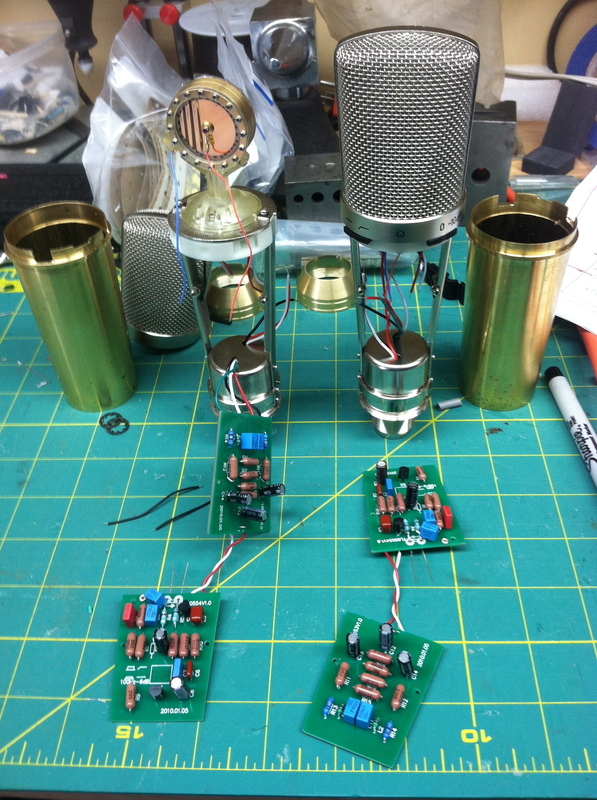 I want to see if I can build a true KM84 amp and see how this sounds when coupled with the modified Nady capsule. 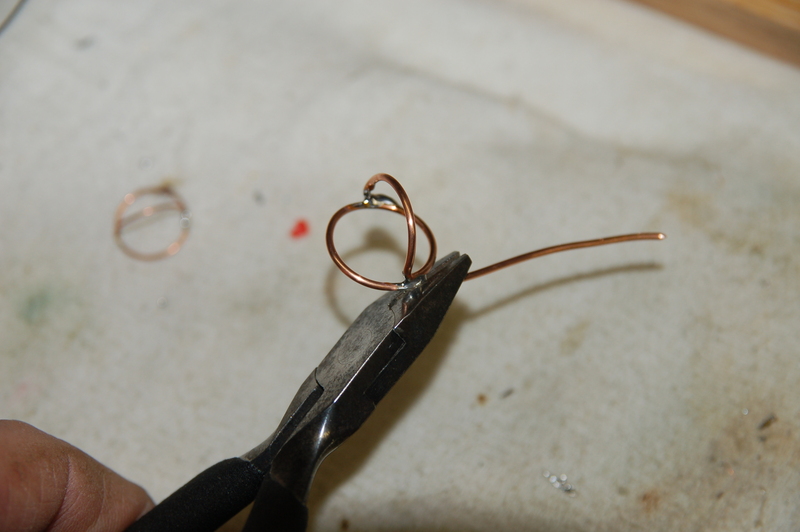 An important part of the KM84’s sound comes from its transformer, and the Nady circuit is transformerless. 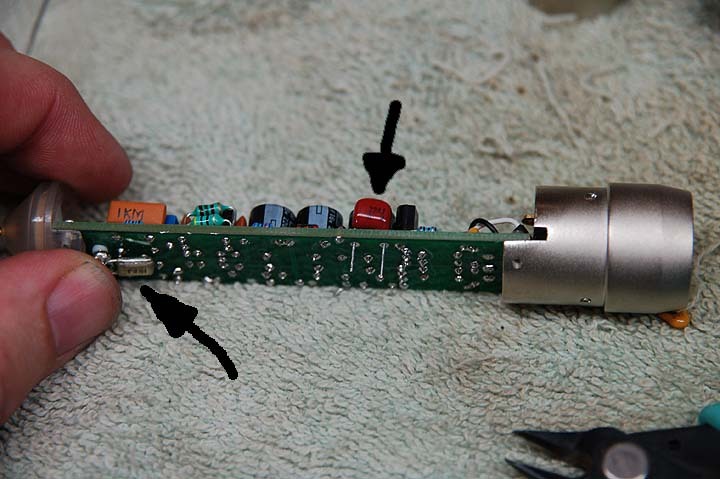 I haven’t been able to find a source for a BV107 transformer (the original part used by Neumann) or a small enough substitute. I understand that Cinemag 2510 will work in this circuit, but I think these are physically too large for a KM84-sized body… I’ll keep you posted. 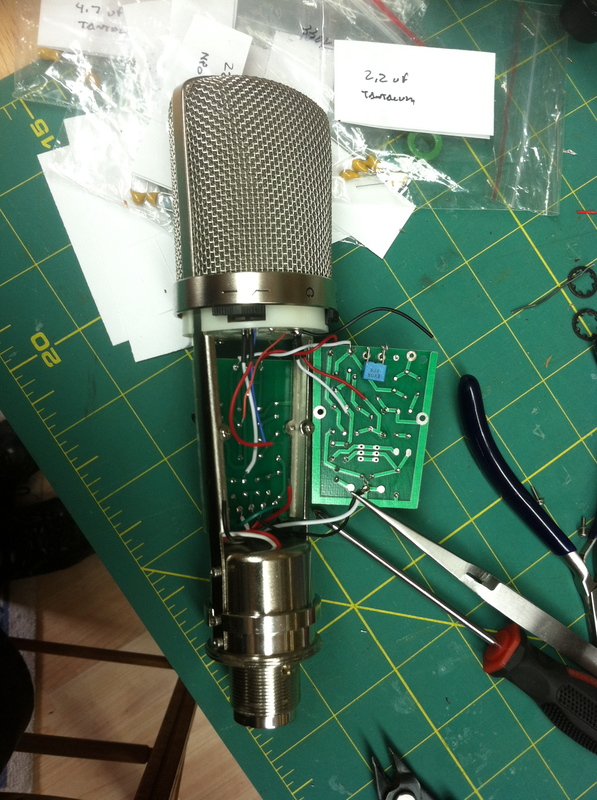 The completed mic. I’m looking for some finer brass screen for the next one, but this one looks and works pretty good. Thanks to some series work that I’ve landed in Knoxville, I’ve recently made an upgrade to my mic locker. 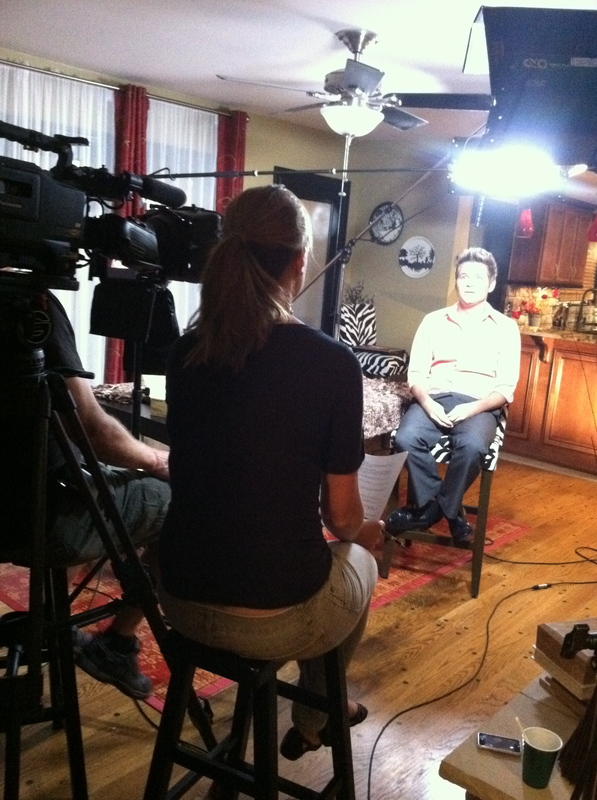 My workhorse mic, a Sennheiser ME66/k6 combo, is a very good mic… for the price. They can be bought new for around $500. But it’s long been on my list of things that I’d like to improve, if ever I could afford it. The other soundperson on the series, Raleigh mixer Neal Gettinger, loaned me his 416T to use for the shoot, and it sounds markedly better than the mic I normally use. Thanks to some sales of used gear at Trew, I had a balance that I applied to a brand-new Sennheiser MKH416p48. It doesn’t seem like much until you plug it in. Physically, it’s a bit smaller and slightly heavier than the 66, so I had to get new mounting clips for my Rycote suspension. Soundwise, though, there’s a big difference in the two. It’s hard to describe in words, but the 416 has a smoother overall quality… the top end is more defined, and the low end seems extended. These differences really show up when you compare the mics side-by-side and switch between them. But almost as important is the familiarity factor… most people know the 416, and it’s been a common player in movie production…. so much so that years ago, when the 416 was discontinued for a model with improved specs, the resulting uproar from the location sound community caused them to put it back into production. I hate to do it, but I’ll probably sell my 415T to help pay for the new mic. I’ll most likely need to sell the ME66 as well, but I haven’t quite decided yet. The fact that the 66 can be battery powered gives it a slight advantage, since this mic can be plugged directly into any camera without the need of a mixer. Like many true condenser mics, The 416 needs 48 volts phantom power to operate properly, and some cameras (and even mixers… older Shures are reported to deliver only 18 volts) can’t provide enough voltage.